The New York Jets were looking to lock up a second straight AFL Eastern Division title as they faced the Houston Oilers on December 6, 1969. 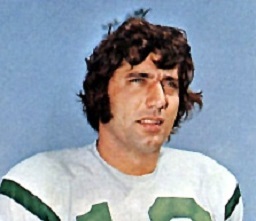 A year after Head Coach Weeb Ewbank’s team had not only won the AFL Championship but stunned the Baltimore Colts, champions of the NFL, in Super Bowl III, the Jets still boasted a formidable offense that featured the passing of QB Joe Namath (pictured above) to wide receivers Don Maynard and George Sauer and the running of FB Matt Snell and HB Emerson Boozer. While there were concerns about the defensive backfield, the line and linebackers were solid. The Jets had an 8-4 record, having lost to the Raiders the previous week. Houston, coached by Wally Lemm, was 5-5-2 and in second place in the mediocre Eastern Division. The Oilers were known for a tough defense that featured DE Elvin Bethea, OLB George Webster, MLB Garland Boyette, cornerbacks Miller Farr and Zeke Moore, and FS Ken Houston. The offense was not so formidable and was without starting FB Hoyle Granger and QB Pete Beathard, who suffered a foot injury in the previous game and was a late scratch, to be replaced by backup Don Trull. There were 51,923 fans in attendance for the Saturday game at the Astrodome. The tone was set on the first play from scrimmage when Don Trull of the Oilers threw a pass that was intercepted by CB Cornell Gordon, who returned it 20 yards to the Houston seven. Three plays later, Emerson Boozer ran two yards up the middle for a touchdown. Jim Turner added the extra point and the visitors had a quick 7-0 advantage. Things got worse for the Oilers when, facing third-and-11 from their own 26, Trull fumbled and DE Verlon Biggs recovered for the Jets. Joe Namath went to the air on first down and connected with George Sauer for a 21-yard TD. Turner again converted and, with only 3:32 elapsed, New York held a 14-0 lead. In response, the Oilers moved effectively on their ensuing possession. FB Roy Hopkins and HB Woody Campbell handled the ball carrying effectively although the first time Trull faded back to pass he was sacked by DT John Elliott. But facing third-and-12, Trull threw to WR Jerry LeVias for 18 yards and, after two runs by Campbell gained seven yards, he connected with TE Alvin Reed (pictured at left) for 15 yards on a third-and-three play. Another third down was converted when the Jets were flagged for pass interference but the drive finally stalled at the New York 17 and Houston turned the ball over on downs. The teams traded punts as the game moved into the second quarter. Midway through the period, another Trull pass was picked off, this time by DE Gerry Philbin who returned it 15 yards to the Houston three. Matt Snell lost three yards on first down, but Namath then threw to HB Bill Mathis for a six-yard touchdown. Turner added the point after and the Jets were up by a comfortable 21-0. 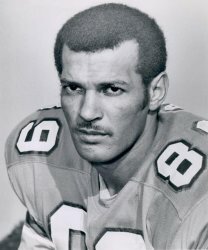 Bob Davis, who had only recently been activated from the taxi squad, was at quarterback when the Oilers returned on offense, but after completing two passes, the second to LeVias for 22 yards, he gave up an interception to LB Paul Crane. This time the visitors were unable to take advantage of the turnover and had to punt. Houston put together a 58-yard scoring drive as Davis completed five passes, three to Reed and two to LeVias, the second of which resulted in a 20-yard TD. Roy Gerela added the extra point. The Oilers got a break when, on the second play of New York’s next series, WR Bake Turner fumbled while running on an end-around and DT Carel Stith recovered at the New York 22. Davis completed a pass to LeVias for 10 yards, but an illegal motion penalty backed Houston up and the home team ended up settling for a 24-yard Gerela field goal that made the halftime score 21-10. The Jets had the first possession of the third quarter, punted, and got the ball back a few plays later when CB John Dockery intercepted a Davis pass and returned it 35 yards to the Houston five. The Oilers were able to keep the Jets out of the end zone, but the visitors came away with a 10-yard field goal by Turner that extended their lead to 14 points. LeVias returned the ensuing kickoff 42 yards and the Jets were penalized 15 yards for a personal foul on top of it, but on the next play Davis fumbled when sacked by Biggs and New York had the ball back at the Houston 47. Runs by Boozer and Mathis picked up 18 yards before Jim Turner came on to kick a 38-yard field goal that put the Jets ahead by 27-10. Davis was sacked twice by Biggs on the next possession and the Oilers had to punt from deep in their own territory. As the game moved into the fourth quarter, the Jets advanced to the Houston three, but this time they came up empty when Turner missed a short field goal attempt. It didn’t matter as, two plays later, Davis gave up another interception, this time with LB Ralph Baker (pictured at right) doing the honors. Veteran QB Babe Parilli was now spelling Namath and threw to Boozer for a gain of 29 yards. Snell scored from three yards out shortly thereafter and, with Turner again converting, the Jets had a commanding 34-10 lead. The next two Houston possessions resulted in turnovers, by a fumble and yet another interception, the second by Dockery. But now New York turned the ball over on a fumble by FB Lee White and safety Johnny Peacock recovered and ran 27 yards for a touchdown. HB Mike Richardson scored for a two-point conversion that made it a 34-18 contest with a little over five minutes to play. The Jets recovered the ensuing onside kick but went three-and-out and punted. Houston drove 80 yards in 10 plays. Davis completed eight passes along the way and ran once for four yards. His last pass was to HB Rich Johnson for a one-yard TD and another toss to WR Jim Beirne added another two-point conversion. It was now an eight-point game and this time the Oilers succeeded on recovering the onside kick, but there were only 32 seconds remaining on the clock. Davis missed on four passes and New York came away with a 34-26 win. As a side note, the attention of the crowd was split between the game before them, during which they often booed the Oilers, and the major collegiate game between Texas and Arkansas that many of them were listening to via radio, causing cheers at odd moments. Houston led in total yards (220 to 213) and in first downs (18 to 12), which was deceptive since the Oilers were playing from behind virtually the entire game. More significantly, they turned the ball over a crippling nine times, six of them by interceptions, which set a club record for the Jets. New York also recorded nine sacks, to none by Houston. The Jets suffered four turnovers. Joe Namath had a relatively run-of-the-mill performance, completing 6 of 16 passes for 52 yards and two touchdowns with none intercepted. Emerson Boozer rushed for 57 yards on 11 carries that included a TD and caught a pass for another 29 yards. Matt Snell contributed 38 yards on his 14 rushing attempts that also included a score. George Sauer topped New York’s receivers with just three catches for 33 yards and a touchdown. For the Oilers, Don Trull was three-of-nine for 37 yards with two interceptions before being relieved by Bob Davis, who was successful on 20 of 35 throws for 192 yards and two TDs, but with four interceptions. Jerry LeVias (pictured at left) and Alvin Reed caught 9 passes apiece, for 110 and 86 yards, respectively, and LeVias scored a touchdown. 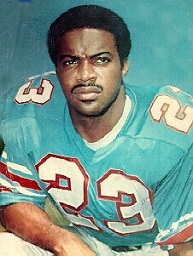 Roy Hopkins led the club in rushing with 30 yards on 9 carries. The Jets defeated Miami in the season finale to finish with a 10-4 record and, in the revamped playoff format that the AFL used in its last season prior to the merger with the NFL, they faced the second-place team in the Western Division, the Kansas City Chiefs, in the first round. The Chiefs won to end New York’s hopes of repeating as AFL Champions. The Oilers won their last game to finish second in the division at 6-6-2 and were swamped by the Oakland Raiders, the Western Division’s top finisher, in their first round playoff game. 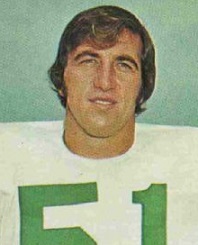 The relief performance against New York was the most significant action for third-year QB Bob Davis in 1969. Used sparingly in his first three seasons with Houston, he moved on to the Jets the following year and saw his most significant NFL action with them before moving on to New Orleans and then the World Football League.